I haven’t said much about this recently, but those of you who have read my books and followed my blog for enough time know that I am not at all a fan of swing thoughts. Instead of helping us, they cause us to doubt ourselves at a time when the completest confidence is needed. But still, your mind is awake and has to be thinking about something. You can’t turn it off. 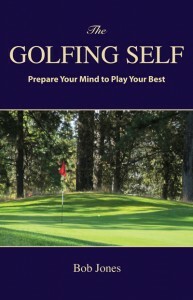 There is one, and only one, thing that should be on your mind while you’re hitting a golf ball, from drive to putt. 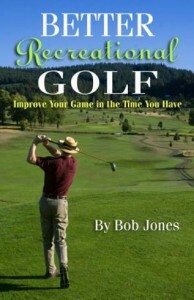 I go into length about it in my book, The Golfing Self, but I’ll give you its flavor in this post. When your mind is calm, it is moving very rapidly. A spinning top or a gyroscope achieve their stability by the speed they rotate. When they slow down and stop, their stability vanishes. Our mind is the same. The faster our mind moves, the more stable it is. This should not be confused with the mind jumping from this to that at breakneck speed. That state of mind is definitely unstable. What I mean is the mind is stable when it is dynamic and has a sense of movment so rapid that the feeling of movement turns into one of great calm, but with this solid foundation. Before your shot, you evaluate your options, pick one, pull a club, take a practice swing, and step into your stance. At this point, everything you need to know for the shot has been dialed in. You don’t have to think about it any more. What you do need to think about is the feeling of calmness based on the infinitely rapid movment of your mind. Feel that and maintain that feeling without interruption from before takeaway all the way through the finish. If you can learn to do that, I guarantee your shotmaking will be the best it can be because doubt has no room to enter your mind and do its damage. Work on hitting different shots. You need them to get the ball around the course, obviously. But work on your mental game, as well. Work on this one thing. Whenever you hit a ball, using any kind of stroke, get your mind moving before you take the club away and maintain that feeling all the way to the completion of the stroke. This is my third post on rhythm and tempo in a month. Maybe you think I’m obsessing on his subject. I’m not. It‘s that important and it can make such a big change if you get it right. A month ago, I talked about the meaning of tempo and rhythm, and went into greater detail two weeks ago. Nothing I said in those posts needs to be changed. But there was something I left out. Here it is now. This 3:1 rhythm looks like a mechanical formula, but it is anything but that. There is a personal dimension to this rhythm, which you must figure out for yourself in order to make it work for you. Let me give you an example from music, where the notion of rhythm comes from. Most of you have heard classical, orchestral music. Most of you as well have heard jazz. The rules of rhythm are the same for each genre. The expression of rhythm is quite different in each, though. One swings, the other doesn’t. To play jazz in an orchestral style would fail. So would trying to play orchestral music in a jazz idiom. We all have our own feeling for rhythm built into the way we think and thus the way we move. For example, some people perform their backswing in strict time, at a steady pace from start to finish. Other people might accelerate a bit as the backswing develops. Some people might move from the backswing to the downswing without pause. Others would allow the backswing to come to a brief rest before it falls into the downswing. In other words, the 3:1 rhythm does not confine your swing to one mechanical style. As long as you stay within that external framework, you can, and should, express it in your own way. A good way to discover your expression is to swing in the air, about halfway between a horizontal plane, like baseball players do, and near vertical, like golfers do. Split the difference. Swing back and forth at that middling angle looking for the way of expressing the 3:1 rhythm in a movement that feels right for you. I know you’ll find it, along with a tempo that’s comfortable. Now try hitting a few golf balls. You might find it to the the easiest thing you’ve ever done. I don’t think anyone will disagree that the most maddening mistake in golf is to chunk a simple greenside chip shot. Just a little swing with a 9-iron, the hole is about 40 feet away, couldn’t be easier, and you lay up sod three inches behind the ball. #@9!! Even the pros do this (Hunter Mahan in the 2010 Ryder Cup) though they do it much less often than we do. Here’s how to reduce chunking to a once-in-a-blue-moon mistake — instead of something you worry about every time you chip. Put your mind on the sole of the club, from the moment of takeaway and through contact. Just think of where the sole is and slide it across the top of the grass when it gets to where the ball is. That’s how you get the club to brush the grass the same way every time, practice stroke or stroke at the ball. Forget about the ball, forget about where you want the ball to go. Think only of sliding the sole across the grass. I figured this out at the range a few weeks ago. Whenever I go to the range I am always looking for ways to make 2 and 2 equal four. The hard part is in realizing that 2 and 2 are right there in front of you so you can put them together. My practice strokes throughout the session had all been identical. I mean identical. I practice this shot a lot, so I know what I’m doing. Each time, the sole of the club brushed top of the grass in the same place and at the same depth. What more needs to be right? But sometimes whenever I moved on to hit the actual chip, I started thinking, “Hit the ball,” and my stroke would change, and sometimes I would hit a little behind the ball. It took me a while to figure out how to correct that. I thought that if I stayed with my practice stroke and played “Brush the grass” instead of “Hit the ball,” I would hit these beautiful chips, one after the other, and chunking was never an issue. And that’s exactly how it worked out. You can use this thought any time you’re hitting a short game shot, from the fairway, greenside, or even from a bunker. It’s the sole that matters. I just talked about this a few weeks ago, and I wouldn’t normally revisit the subject for another few moths at the earliest. But a few things came up after that most recent post was published that made me realize the difference between rhythm and tempo is not clear in the golfing world. Either people get rhythm and tempo mixed up, or think they are the same thing. You must understand the difference if you are to build them into your swing. What came up? Two things. First, I was talking to one of my sons about his swing. He was telling me his rhythm was very good and when I asked him more about it, it became clear he was really talking about his tempo. And when he mentioned tempo, it turned out he was really talking about his timing. And when he mentioned timing, he was talking about rhythm. Then I went to a post I wrote earlier in the year about Ernie Els’s swing, in which the embedded video by Andrew Rice talks about how to make your swing faster (good advice) but says to do that he wants us to have three counts to the top of the backswing and one count back down to the ball (more good advice). He wants you to speed up your swing and tells you what the rhythm of the swing is. Oh, my. Even the experts get confused. So let me be very clear here. Rhythm and tempo are words taken from music. Tempo is the overall speed of a composition. Rhythm is the relative duration of its component parts. You can play Stars and Stripes Forever at a quick pace or slower pace (tempo) but the quarter notes stay quarter notes, and the eighth notes stay eighth notes (rhythm). 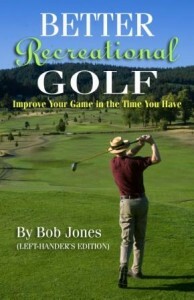 If the golf swing were music, the backswing would get three beats, and the downswing would get one beat. Count out your swing, starting at 1 when you take the club away. Then count 2, 3, 4 to the top of the backswing, and 5 back down to the ball. That’s your 3:1 rhythm laid bare. The tempo of the swing is how long it takes to make those five counts. It takes Els 1.0 seconds to execute a 3:1 rhythm. It takes Price 0.8 seconds to execute his 3:1 rhythm. So if you want to speed up your swing, just take less time to execute the 3:1 rhythm.